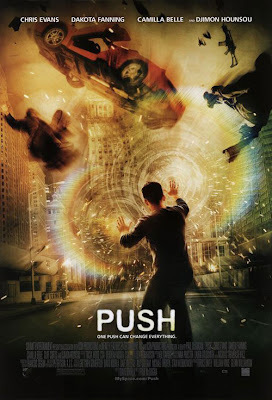 I was really looking forward to seeing Push (2009). To my surprise, it was released straight to DVD here, and was given anything but a good advertising run. This is the type of movie you would see at the cinemas. But now I'm wondering if the movie hitting the shelves first wasn't such a bad idea after all. Push is a series of interlocking stories about a few people who have super power abilities. For instance, there are watchers, who are people who can see into the future. Joining them are the movers, who of course have telekinetic abilities which allow them to move things without touching them. Last but not least, there are the pushers, who push thoughts into other peoples brains making them think what the pusher wants them to think. These forces come together to wage war on each other, but some form alliances to take down the bad guys. On paper, I thought this would be a good movie. It has Chris Evans, Dakota Fanning, Camilla Belle and Djimon Honsou in it, who are all relatively famous and well liked around the world. And the fact that it was an action/thriller about just normal people with anything-but-normal powers got me a little excited too. But this movie was somewhat of a disappointment. Sure, it had it's moments. But those moments were few and far between, leaving empty gaps filled up with complete nonsense. The effects were good, the perrformances were pretty text-book and the direction caused a bit of an eye sore. Overall, a jumpy spectacle which was alright, not amazing.